This semester, I was fortunate enough to take a class based on constructionism, a philosophy developed by Seymour Papert. Constructionism builds upon Piaget’s philosophy of constructivism, which proposes that learners do not directly receive knowledge but rather construct knowledge for themselves (Papert, 1993, p. 142). Through constructionism, Papert connects the process of constructing knowledge in the mind with the process of constructing a physical object. He asserts that “the construction that takes place ‘in the head’ often happens especially felicitously when it is supported by construction of a more public sort ‘in the world’ – a sand castle or a cake, a Lego house or a corporation, a computer program, a poem, or a theory of the universe. Part of what I mean by ‘in the world’ is that the product can be shown, discussed, examined, probed, and admired. It is out there” (Papert, 1993, p. 142). It is not surprising, therefore, that the final project in this course based on constructionism was to make something. What were my experiences with constructionism? As I developed an idea for my final project, I stated two goals for myself: 1) I wanted to create an object that I could use in my future English classes, and 2) I wanted this object to be something that my students could also create. These goals led me to think about the relationship between “creating” and “writing.” We do a lot of writing in English classes, and while I view writing as an extremely creative process, I worry that students often do not share this view. I started brainstorming about creative writing projects that would help students understand that an act of writing is an act of creating. 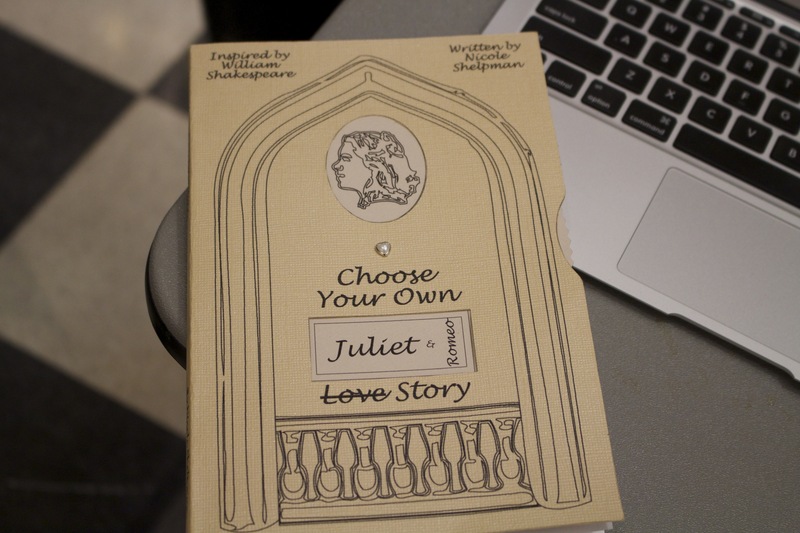 With these thoughts in mind, I decided to write a Choose Your Own Adventure Book (CYOAB) based on Romeo and Juliet. In this genre, the reader gets to direct the story; at the end of each page, the reader has to make a choice in order to find out what page to turn to next. These interactive books are exciting to read because the reader gets to be a part of the story, and I thought that a CYOAB based on Romeo and Juliet could help students become interested in the play. Through this process, I created a classroom resource for myself, and I have learned about the complexities of creating a CYOAB. I am excited about engaging students in the writing process of this genre because it highlights the creative aspect of writing; in addition to writing several story lines, the author has to create an intricate plot structure in which those story lines diverge or converge at different places. I believe that constructionism can make education more exciting and meaningful because it allows students to create a physical representation of their learning that can be shared with others. My 150-page Choose Your Own Love Story “can be shown, discussed, examined, probed, and admired,” to borrow from Papert’s quote above (1993, p. 142). Not many courses have inspired me to create something that I was so eager to share with my family and friends. Few courses have given me the opportunity to not only learn something but to also make something that will still have significance for me in the future. When I return to teaching next fall, I want to give my high school students the opportunity to create something meaningful – something that is more than just an essay, just a story, or just a project. Now that I have completed my first semester of graduate school, I am beginning to redesign my philosophy of education. I do not know exactly how constructionism will fit into an English class; having students write CYOABs is only one example of a project inspired by constructionism. Ideally, I would like to give students as much choice as possible in what they create. Though I do not specifically know how I will integrate constructionism into my classes, I do know that my experiences this semester are already influencing my beliefs about education. Just as a CYOAB gives readers more control over the story, constructionism gives students more control over their education. If I provide students with more opportunities to create, then I might be inspired by how adventurous they’re willing to be. Source: Papert, S. (1993). The children’s machine (Chapter 7, pp. 137-156). New York: Basic Books.